I will submit your site 25 EDU & GOV sites, that will help you to Get Higher Position in the search engine. EDU.GOV domains have authority and trust inside the eyes of Google and also other search engines. All links from High Domain Authority. 25 different Domain that means 100% Unique Domain with very low OBL. All backlinks are created 100% Manually. It`s 100% safe for any kinds of website. Pinterest page or anything you can link to. Finally, I will provide full reports with login details. Q. How many keywords you accept per order? A. We accept a maximum of 10 keywords per order. Q. Do you do anything for indexing these Edu & Gov links? A. You will get a complete Excel report after completion. You can check live clickable Edu links in the report. Q. What is all the information you need from me? A. We need only Keyword, URL, Description, and Title from you. 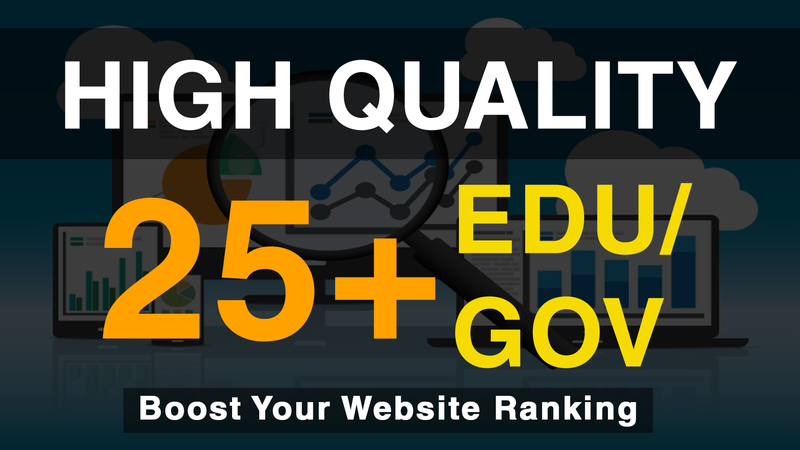 Add 25+ Edu/Gov High Quality Profile Backlinks within a day is ranked 5 out of 5. Based on 63 user reviews.